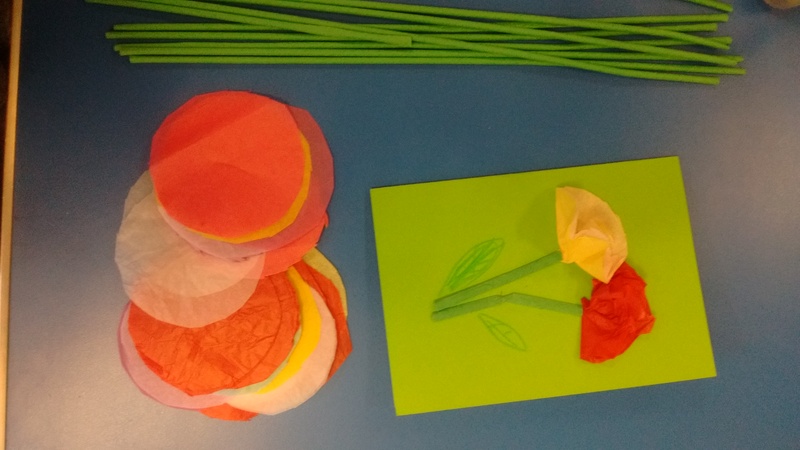 We used tissue paper circles and paper straws to make flowers for Mother’s Day cards. As we were thinking about letters in our Bible story, we put the cards into envelopes, addressed them and stuck on a stamp. Then the children posted them in a special post box I had provided (the nearest real one was too far away for us to pop out to it; I dropped the cards into it later. 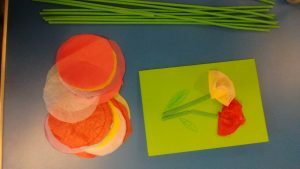 Tissue paper cut into circles – I used the bottom of a large PVA glue bottle as my template! Make the flowers by taking two or three circles together (the same or different colours according to taste). I just gave the centre of the circle a bit of a twist, but it may work better if you fold the circle in half and then in half again before twisting. 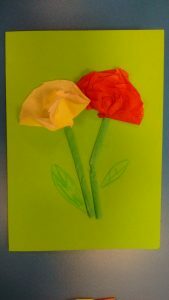 Glue them to the card and glue on the straws or pipe cleaners for stems. We drew on leaves if we wanted them, or you could cut some from green tissue paper.